One key word I’d use to describe my style is polished, and that doesn’t change when I’m flying oversees. While I definitely want to be comfortable for those longer, sleepover flights, I want to look put together enough so that I can be ready for anything. I also just don’t enjoy looking like a slob, so I try to avoid wearing clothing items that would do that. That’s why when I’m planning my outfits for long flights like this, I look for cute and casual staples that can be easily elevated with the addition of another piece or two. In this case, I found this cute sweatshirt dress during the Anniversary Sale that is super soft and loose. It definitely meets the comfort requirements! While I wouldn’t say it’s super flattering or fabulous by itself, adding a sleek leather jacket or a cute belt are ways to give it a more stylized look overall. I also just like having an extra layer in case the plane is super chilly, so this leather jacket comes in handy for that! This dress is an investment to be sure, but the elevated silhouette makes it wearable from the plane straight to dinner this fall/winter. So chic! This uber soft t-shirt dress comes in three pretty colors and features a cool cuffed sleeve detail. It’s also under $100! 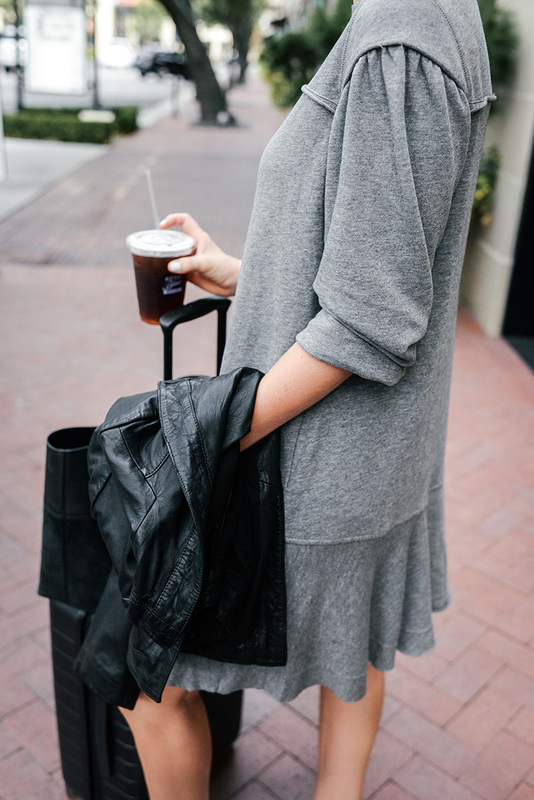 This ribbed number would be a dream on a lengthy travel day this fall! Throw on a jean jacket and sneakers and you’re good to go. This swing midi dress is perfect for Labor Day travel! Also under $100. Here’s another soft and loose look ideal for long flights! Your legs will stay warm with this maxi style too! Throw on a belt pre- or post-flight to add instant finesse. This easy striped number is something you will definitely wear every year. This dress is incredibly streamlined, comes in black or white and is under $100. Easy to style and wear for whatever! PS – while I wore this dress on the plane to Zurich, I ended up switching out my jacket, shoes and accessories to match my new Paravel bags you saw in Monday’s post! I shot this look before I received those in the mail – I’m glad I did too, because I didn’t have time to shoot any other outfits the week I left town!! This dress is super versatile and looks great with all kinds of colors, so naturally the outfit still worked out perfectly. I have been wanting to see how this dress looks on! It looks so cute! I love this look! I’m trying to find a good outfit for a long haul flight coming up, so this was perfect inspiration. This is the cutest airport outfit! And that dress looks so comfy too!